Looking for an exclusive humidor with a remarkable appearance? The Montgomery's extraordinary design and finish provide its owner with an unmatched look and feel. Features layers of lacquer over a rich brown Elm wood finish brushed with a hint gray. This unique finish paired with its arc shaped top and silver studded accents make for a distinctive design in a humidor. 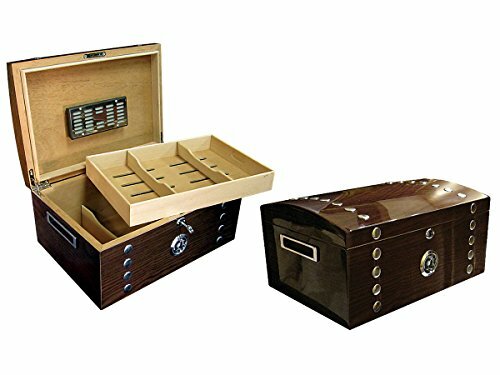 Includes a 150 count cigar capacity, 4 adjustable dividers, polished silver handles & a matching lock & key set. Its interior features a removable tray, a high polished 'mirror finish' silver humidifier & a silver framed external hygrometer. The underside of the Montgomery's lid contains an invisible steel lining just underneath the cedar which allows the humidifier to attach magnetically. This means there is no need for any double faced tape or two-sided velcro. A magnet is recessed into the back of the humidifier for reliable mounting directly on the cedar every time. Have a need to relocate your humidifier? Just lift it and set it or slide it anywhere across the cedar into position!